The brevity and simplicity of modern communication has changed the way we interact. As such, the once commonplace act of letter writing is now special and holds a lot of emotional value. We’re so used to sending off quick messages while in transit that to take the time to sit down, think, breathe, and write something down from the heart, each word carefully weighted, is truly special. 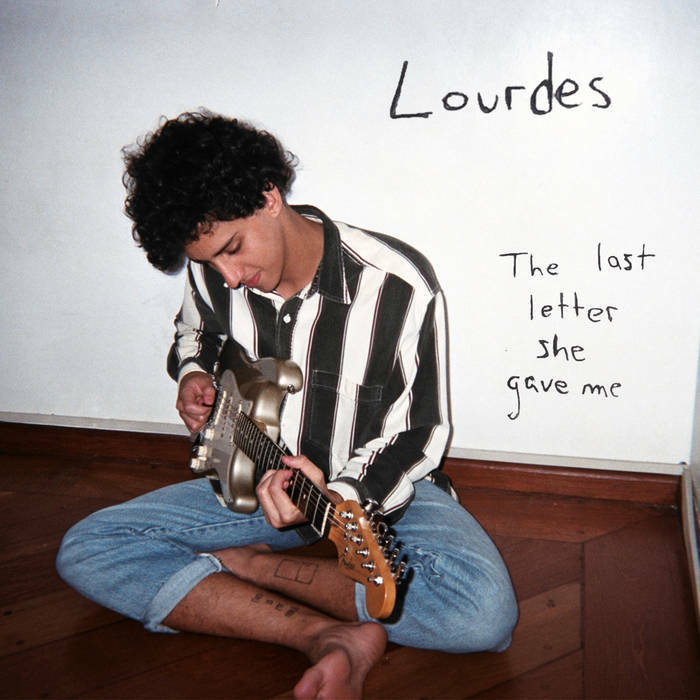 On The Last Letter She Gave Me, Toronto-based Lourdes responds to the final letter from his grandmother. We don’t know anything about the contents of this letter but it is clearly meaningful. This EP is primarily instrumental, “foi te ver tocar” being the lone song with vocals, and wavers between jangle-pop and ambient. The EP’s warmth is explained in the Bandcamp notes: “Everything was recorded in the living room of [producer João Elbert’s] house.” It is anchored at home. The Last Letter She Gave Me begins with the sound of a cassette tape being slid into its slot and the play button hit. It’s followed by a smokey, chilled-out guitar riff and electronic beat. This is Lourdes’ “Intro to my Grandma,” an effortless cool sounding woman. On the following track “foi te ver tocar,” a detailed and spacey experimental-pop track, Lourde sings in Portuguese, perhaps in homage to his grandmother, and the emotion is tangible. “Verde” is the cheekiest of the tracks. It’s the third glass of wine at family dinners, a wink, and a dirty joke. The funky bass line encourages this playfulness. Around the one minute mark, the mood shifts slightly as the instrumentals get hazier and the track ends with a guitar melody that is then picked up in the final track, “The Last Letter She Gave Me.” This melody, sometimes altered or camouflaged, is there pretty consistently and it feels as if it is Lourde’s grandmother if she were a melody. Perennial.